Objective: To investigate the effect of tamsulosin on urinary calculi formation and renal function in rats. Patients and Methods: SD rats were randomly divided into three groups, including control, model group established by Melamine (Mel) treatment, and tamsulosin group. The weight, 24 h urine volume, water intake, Mel level, Scr, BUN, UAlb, ratio of kidney to weight, as well as calculus formation rate were analysed. TNF-α and interleukin (IL)-1β levels were detected by real-time PCR and ELISA. Caspase-3 activity was measured by a commercial kit. Results: Calculus formation rate reached 90% in model group. Body weight was reduced, while 24 h urine volume, water intake, Mel level, Scr, BUN, UAlb, ratio of kidney to body weight, as well as caspase-3 activity were increased in model group compared with those in control group. In addition, TNF-α and IL-1β contents were significantly elevated in model group compared with those in control group (P<0.05). The calculus formation rate was 40% in tamsulosin group, in which rats displayed reduced 24 h urine volume and water intake, increased body weight, declined Mel, Scr, BUN, UAlb and the ratio of kidney to weight, decreased TNFα and IL-1β levels, as well as reduced caspase-3 activity compared with rats from model group (P<0.05). Conclusions: Mel induces urinary calculus formation and enhances inflammatory factors secretion and apoptosis, leading to renal injury. However, tamsulosin treatment suppresses Mel-induced urinary calculus formation, inhibits inflammatory factors secretion, and restrains apoptosis to improve renal function, suggesting tamsulosin might be used a potential therapeutic agent in the treatment of urinary calculus. Urinary calculus, Melamine, Ta	msulosin, Uric acid, Renal function. Urinary calculus is a worldwide common disease that occurs at each age stage, resulting in pain [1,2]. China is one of the three high-prevalence areas of calculus. Urinary calculi patients are ranked as the first populations who receive urinary surgery with increasing trend [3,4]. Following the increased incidence and recurrence rate, urinary calculus seriously threats to global health and social economy . Multiple factors affect urinary calculi, such as environment, diet, lifestyle, genetic factors, gender, and metabolic abnormalities [6,7]. Melamine (Mel) is a kind of triazine nitrogen heterocyclic compound that can polymerize with other substances through hydrogen bond under vacuum or solution . Mel can be discharged in urine directly without metabolism in the body . However, Mel can damage kidney and form urinary calculus . Urinary calculus is induced by complicated pathogenic factors, while discovering the medications that can influence urinary calculus formation is in favor of adjuvant therapy [11,12]. Tamsulosin is the most commonly used α- blocker for the medical treatment of ureteric stones because of its excellent tolerability and its uroselectivity for α1a and α1d, resulting in relaxation of the smooth muscles of the lower ureter, facilitation of stone passage, and relieving of pain [13,14]. Drug during episodes of ureteral colic, tamsulosin treatment can increase the stone expulsion rate and reduce the stone expulsion time, the need for hospitalization and endoscopic procedures, suggesting tamsulosin might be used in controlling colic pain . Moreover, addition of tamsulosin to conventional treatment is beneficial in terms of clearance of lower ureteral stones and this effect was more evident for larger stones, especially when combined with shock wave lithotripsy . Furthermore, tamsulosin alone as medical expulsive therapy for distal ureteral calculi has been demonstrated to have excellent expulsive effectiveness . However, the impact of tamsulosin on urinary calculi formation and renal function remains unclear. This study used Mel to establish rat urinary calculus model to investigate the impacts of tamsulosin on urinary calculus and renal function. A total of 30 healthy SD rats aged 3 months old and weighted 250 ± 30 g were bought from experimental animal center in Fujian Medical University and raised in SPF grade experimental animal center with a temperature at 21 ± 1°C, relative humidity at 50-70%, and 12 h day/night cycle. Rats were used for all experiments and all procedures were approved by the Animal Ethics Committee of 2nd Affiliated Hospital, Fujian Medical University. Mel (chemical purity ≥ 98%) was purchased from Fujian chemical company. Serum creatine detection kit was bought from Roche. Caspase-3 activity detection kit was obtained from Pall Life Sciences. TNF-α and IL-1β ELISA kits were derived from R&D (USA). Rat urine protein detection reagent was purchased from Beijing Furui. RNA extraction kit and reverse transcription kit were purchased from Axygen (USA). Labsystem Version 1.3.1 microplate reader was provided by Bio-rad (USA). Surgical instrument was bought from Suzhou medical apparatus factory. Operation microscope was obtained from Zhenjiang optical instruments company. AU8500 automatic biochemistry analyzer was derived from Beckmann (Germany). ABI7900 HT Real-time PCR amplifier was derived from ABI (USA). EASY-nLC™ 1200 system high performance liquid chromatography was bought from Thermo Fisher (USA). Other reagents were purchased from Sangon (China). Experimental animal grouping and urinary calculus modelling: The rats were randomly and equally divided into three groups with n=10 in each group. The rats in model group were feed by fodder with 3% Mel and normal drinking for 8 w . The rats in tamsulosin group were treated with 0.1 mg/kg tamsulosin  via gavage once a day during modeling . The experiment was in accordance with animal ethics. Sample collection: After treatment, the blood was extracted from the aorta to the vaccum biochemistry tube using negative pressure acquisition method. After 30 min, blood was centrifuged at 3600 rpm at 4°C for 10 min. After that, the supernatant was stored at -20°C. The left renal tissue was obtained after sacrifice of the rats and stored at -80°C. The urine was collected from the metabolism cage and stored at -20°C. Renal function detection: Urine pH, Scr, and BUN values were tested by automatic biochemistry analyzer. UAlb was determined by radioimmunoassay. Ratio of kidney to body weight was calculated. Urine Mel concentration detection: Urine Mel was tested by high performance liquid chromatography. A total of 0.15 ml sample was added to 5 ml trichloroacetic acid. Next, 5 ml ddH2O was added into the sample followed by filtration for detection. PhenomenexC8 was adopted. Heptane sulfonic acid sodium citrate buffer+acetonitrile (v/v, 90:10) was selected as mobile phase and the flow velocity was 112 ml/min. At last, a total of 10 μl sample was tested at 240 nm. ELISA: ELISA was used to test TNF-α and IL-1β contents in the serum. A total of 50 μl diluted standard substance were added into each well to establish a standard curve. Next, 50 μl sample was added into the plate and washed for five times. Then the plate was incubated with 50 μl conjugate reagent at 37°C for 30 min. After washed for five times, 50 μl color agent A and B were added into the plate and incubated at 37°C for 30 min under dark. At last, 50 μl stop buffer was added to stop the reaction and the OD value at 450 nm was measured. The OD value of standard substance was used to prepare the linear regression equation, which was adopted to calculate the concentration of samples. Real-time PCR: Total RNA was extracted from renal tissue by Trizol and reversely transcripted into cDNA. The primers were designed using Primer Premier 6.0 software and synthetized by Invitrogen (Table 1). Real-time PCR was performed with conditions as follows: 35 cycles of 92°C for 30 s, 58°C for 45 s, and 72°C for 35 s. GAPDH was selected as an internal reference. The relative expression of mRNA was calculated by 2-ΔCt method. Caspase 3 activity detection: Caspase 3 activity was tested according to the manual instructions. The renal tissue was digested by trypsin and centrifuged at 600 xg for 5 min at 4°C. Next, 2 mM Ac-DEVD-pNA was added into the cells followed by detection of the OD values at 405 nm to calculate caspase 3 activity. All data analyses were processed by SPSS19.0 software. All data were presented as mean ± Standard Deviation (SD) and compared by t-test or one-way ANOVA. P<0.05 was depicted as statistical significance. Rat survival and urinary calculus formation rate were observed. The rats in control group exhibited good mental state, glossy hair, and normal eating, drinking, activity, and urine output. Urinary calculus was formed in nine out of ten rats after Mel induction. The rats in model group presented significant spirit drooping, hair removal, water quantity increase, urine output elevation, and weight loss compared with control rats (P<0.05). However, tamsulosin treatment obviously reduced calculus formation rate (40%), improved general condition, increased weight, declined water consumption and urine volume compared with un-treatment in model group (P<0.05) (Table 2). *P<0.05, compared with control; #P<0.05, compared with model group. Table 2. General index analysis. Ratio of kidney to body weight, Scr, BUN, and UAlb levels were markedly increased in rats from model group compared with those in control rats (P<0.05). However, tamsulosin significantly reduced Scr, BUN, and UAlb levels compared with model group (P<0.05) (Table 3). Table 3. Renal function detection. Mel content was obviously elevated in the urine of rats from model group compared with that in control rats (P<0.05). However, tamsulosin treatment markedly declined Mel level compared with model group (P<0.05) (Figure 1). Figure 1: The impact of tamsulosin on urine Mel content in the rat. *P<0.05, compared with control; #P<0.05, compared with model group. Caspase-3 activity was significantly enhanced in the renal tissue of rats from model group compared with that in control rats (P<0.05). Tamsulosin treatment apparently suppressed Caspase-3 activity compared with model group (P<0.05) (Figure 2). 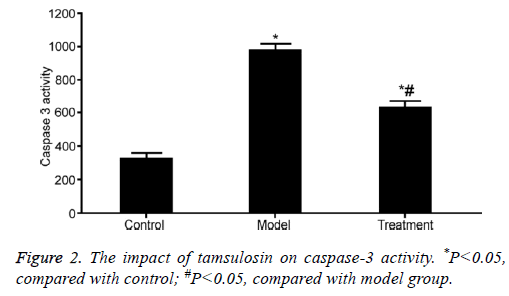 Figure 2: The impact of tamsulosin on caspase-3 activity. *P<0.05, compared with control; #P<0.05, compared with model group. Real-time PCR was adopted to test TNF-α and IL-1β mRNA expressions in renal tissue. TNF-α and IL-1β mRNA expressions were markedly upregulated in renal tissue from model rats compared with those in control rats (P<0.05). Tamsulosin treatment significantly inhibited TNF-α and IL-1β mRNA expressions compared with model group (P<0.05) (Figure 3). Figure 3: The impact of tamsulosin on inflammatory cytokines TNF-? and IL-1? expressions in renal tissue. *P<0.05, compared with control; #P<0.05, compared with model group. ELISA was used to detect TNF-α and IL-1β contents in the serum. TNF-α and IL-1β contents were obviously enhanced in the serum from model rats compared with those in control rats (P<0.05). Tamsulosin treatment apparently restrained TNF-α and IL-1β contents compared with model group (P<0.05) (Figure 4). 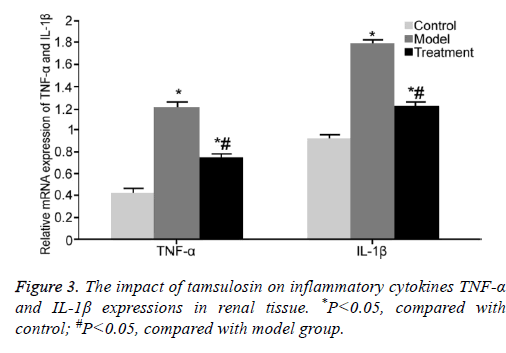 Figure 4: The impact of tamsulosin on inflammatory cytokines TNF-? and IL-1? expressions in the serum. *P<0.05, compared with control; #P<0.05, compared with model group. As a common disease in urinary surgery, the incidence of urinary calculus is gradually increased, while its specific pathogenic factors and mechanism remains poorly understood. Mel is easy to dissolve in acidic environment, whose solubility is higher than that in neutral or alkaline solution. In addition, it is slightly soluble in water . Normal renal environment is acidity, thus in favor of Mel dissolution and self-assembly. Mel may form small molecular substance in the urine, especially acidic substance that delays the urethra to form urinary calculus . On the other side, Mel can damage renal function. This study adopted 3% Mel to feed SD rat and obtained 90% urinary calculus formation rate. Moreover, Mel obviously increased 24 h urine volume, water intake, Scr, BUN, UAlb, and ratio of kidney to body weight, suggesting that Mel is one of the reasons to cause urinary calculus formation and renal damage. Tamsulosin plays an important role in regulating ureter . Tamsulosin can enlarge ureter lumen and inhibit basic elasticity and peristaltic frequency by blocking adrenergic receptor to facilitate calculus discharge [24,25]. However, the role of tamsulosin on urinary calculus induced by Mel has not been reported. This study found that tamsulosin treatment significantly declined calculus formation rate, improved general status, increased body weight, reduced 24 h urine volume and water intake, increased pH value, declined Mel, Scr, BUN, and UAlb, as well as declined ratio of kidney to weight. Since the urinary tract is in inflammatory state during calculus formation, it produces a large amount of inflammatory cytokines and induces apoptosis, leading to acceleration of calculus formation and renal injury [26,27]. This study suggested that Mel upregulated TNF-α and IL-1β contents in urinary calculus. It was showed that TNF-α and IL-1β are critical inflammatory cytokines in mediating urinary tract and renal vessel endothelium injury, enhancing caspase-3 activity, and inducing renal tissue apoptosis . This study presented that tamsulosin suppressed caspase-3 activity, declined TNF-α and IL-1β contents, and regulated inflammation and apoptosis. However, the exact mechanism by how tamsulosin ameliorates lithangiuria formation and improves renal function after Mel treatment remains unclear and requires further studies. Mel induces urinary calculus formation and enhances inflammation and apoptosis, leading to renal injury. Tamsulosin treatment suppresses urinary calculus formation induced by Mel, inhibits inflammatory factors secretion, and restrains apoptosis to improve renal function. This study provides theoretical basis and clinical evidence for tamsulosin application in the treatment of urinary calculus. Yu Y, Li J, Guo L, Gu T, Xiao R, Ye Y, Pan Q, Zhang Y, Huang H. Bilateral duplex urinary collecting systems accompanied with horseshoe kidneys deformity and right renal ureteral calculi and hydronephrosis: Diagnosis in magnetic resonance urography. J Xray Sci Technol 2017; 25: 667-672. Albert A, Tiwari V, Paul E, Ganesan D, Ayyavu M, Kujur R, Ponnusamy S, Shanmugam K, Saso L, Govindan Sadasivam S. Expression of heterologous oxalate decarboxylase in HEK293 cells confers protection against oxalate induced oxidative stress as a therapeutic approach for calcium oxalate stone disease. J Enzyme Inhib Med Chem 2017; 32: 426-433. Wu W, Yang Z, Xu C, Gu X, Yang S, Liao S, Wang R, Gao W, Ye Z, Zeng G. External physical vibration lithecbole promotes the clearance of upper urinary stones after retrograde intrarenal surgery: a prospective, multicenter, randomized controlled trial. J Urol 2017; 197: 1289-1295. Anjum M, Moorani KN, Sameen I, Mustufa MA, Kulsoom S. Functional and structural abnormalities of the kidney and urinary tract in severely malnourished children - A hospital based study. Pak J Med Sci 2016; 32: 1135-1140. Cancian M, Brito J, Renzulli J, Pareek G. Endourologic and open ureterolithotomy and common sheath reimplant for large bladder and distal ureteral calculi. J Endourol Case Rep 2016; 2: 209-211. Jin C, Fan Y, Zhang Q, Wang Y, Wu S, Jin J. Removal of foreign bodies embedded in the urinary bladder wall by a combination of laparoscopy and carbon dioxide cystoscopic assistance: Case report and literature review. Investig Clin Urol 2016; 57: 449-452. Kang DH, Cho KS, Ham WS, Kwon JK, Lee SH, Choi YD, Lee JY. Ureteral stenting can be a negative predictor for successful outcome following shock wave lithotripsy in patients with ureteral stones. J Urol 2017; 197: 832. He Z, Zhang C, Zeng G. Minimally invasive percutaneous nephrolithotomy guided by ultrasonography to treat upper urinary tract calculi complicated with severe spinal deformity. Int Braz J Urol 2016; 42: 960-966. Zanetti SP, Boeri L, Catellani M, Gallioli A, Trinchieri A, Sarica K, Montanari E. Retrograde intrarenal surgery (RIRS), regular and small sized percutaneous nephrolithotomy (PCNL) in daily practice: European Association of Urology Section of Urolithiasis (EULIS) Survey. Arch Ital Urol Androl 2016; 88: 212-216. Lu X, Wang J, Cao X, Li M, Xiao C, Yasui T, Gao B. Gender and urinary pH affect melamine-associated kidney stone formation risk. Urol Ann 2011; 3: 71-74. Al-Kharashi A, Azimzadeh AA, Leung J, Radomski S, Radomski L, Lam WC. Anterior segment optical coherence tomography changes with introduction and discontinuation of tamsulosin. Saudi J Ophthalmol 2016; 30: 150-156. Kosilov K, Loparev S, Kuzina I, Shakirova O, Zhuravskaya N, Lobodenko A. The effective tool for self-assessment of adherence to treatment in patients with benign prostatic obstruction and overactive bladder symptoms. Aging Male 2017; 20: 39-44. Bonnell LN, SooHoo JR, Seibold LK, Lynch AM, Wagner BD, Davidson RS, Taravella MJ. One-day postoperative intraocular pressure spikes after phacoemulsification cataract surgery in patients taking tamsulosin. J Cataract Refract Surg 2016; 42: 1753-1758. Cai JL, Zhou Z, Yang Y, Yan YF, Jing S, Na YQ. Efficacy and safety of medium-to-long-term use of tolterodine extended release with or without tamsulosin in patients with benign prostate hyperplasia and larger prostate size: a double-blind, placebo-controlled, randomized clinical trial. Chinese Med J 2016; 129: 2899-2906. Dellabella M, Milanese G, Muzzonigro G. Efficacy of tamsulosin in the medical management of juxtavesical ureteral stones. J Urol 2003; 170: 2202-2205. Kupeli B, Irkilata L, Gurocak S, Tunc L, Kirac M, Karaoglan C, Bozkirli I. Does tamsulosin enhance lower ureteral stone clearance with or without shock wave lithotripsy? Urology 2004; 64: 1111-1115. Dellabella M, Milanese G, Muzzonigro G. Medical-expulsive therapy for distal ureterolithiasis: randomized prospective study on role of corticosteroids used in combination with tamsulosin-simplified treatment regimen and health-related quality of life. Urology 2005; 66: 712-715. Ko IG, Moon BM, Kim SE, Jin JJ, Hwang L, Ji ES, Kim CJ, Kim TH, Choi HH, Chung KJ. Effects of combination treatment of alpha 1-adrenergic receptor antagonists on voiding dysfunction: study on target organs in overactive bladder rats. Int Neurourol J 2016; 20: S150-158. Kontani H, Shiraoya C. Method for simultaneous recording of the prostatic contractile and urethral pressure responses in anesthetized rats and the effects of tamsulosin. Jpn J Pharmacol 2002; 90: 281-290. Ren ST, Du YX, Xu CF, Zhang JJ, Mo LP, Sun Y, Gao XL. Preventive and therapeutic effects of sodium bicarbonate on melamine-induced bladder stones in mice. Urolithiasis 2014; 42: 409-414. Kumar N, Rosy, Goyal RN. A melamine based molecularly imprinted sensor for the determination of 8-hydroxydeoxyguanosine in human urine. Talanta 2017; 166: 215-222. Varun S, Kiruba Daniel SC, Gorthi SS. Rapid sensing of melamine in milk by interference green synthesis of silver nanoparticles. Mater Sci Eng C Mater Biol Appl 2017; 74: 253-258. An L, Sun W. Prenatal melamine exposure impairs spatial cognition and hippocampal synaptic plasticity by presynaptic and postsynaptic inhibition of glutamatergic transmission in adolescent offspring. Toxicol Lett 2017; 269: 55-64. Terakado M, Suzuki H, Hashimura K, Tanaka M, Ueda H, Kohno H, Fujimoto T, Saga H, Nakade S, Habashita H, Takaoka Y, Seko T. Discovery of ONO-7300243 from a novel class of lysophosphatidic acid receptor 1 antagonists: from hit to lead. ACS Med Chem Lett 2016; 7: 913-918. Rak A, Canale V, Marciniec K, Zmudzki P, Kotanska M, Knutelska J, Siwek A, Stachowicz G, Bednarski M, Nowinski L, Zygmunt M, Zajdel P, Sapa J. Arylsulfonamide derivatives of (aryloxy)ethyl pyrrolidines and piperidines as alpha1-adrenergic receptor antagonist with uro-selective activity. Bioorg Med Chem 2016; 24: 5582-5591. Oh WS, Kim YS, Yeom JS, Choi HK, Kwak YG, Jun JB, Park SY, Chung JW, Rhee JY, Kim BN. Developing a model to estimate the probability of bacteremia in women with community-onset febrile urinary tract infection. J Infect Dev Ctries 2016; 10: 1222-1229. Chhiber N, Kaur T, Singla S. Rottlerin, a polyphenolic compound from the fruits of Mallotus phillipensis (Lam.) Mull. Arg. impedes oxalate/calcium oxalate induced pathways of oxidative stress in male wistar rats. Phytomedicine 2016; 23: 989-997. Lee YC, Hsiao CY, Hung MC, Hung SC, Wang HP, Huang YJ, Wang JT. Bacteremic urinary tract infection caused by multidrug-resistant enterobacteriaceae are associated with severe sepsis at admission implication for empirical therapy. Medicine 2016; 95: 3694.